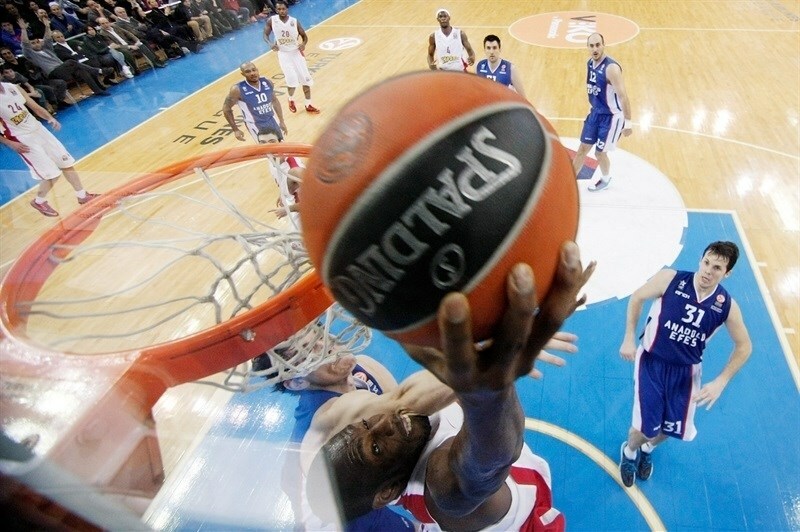 Anadolu Efes Istanbul used an outstanding defensive performance in the second half to beat Olympiacos Piraeus 84-70 and hand the Greek team its first loss in the Top 16. 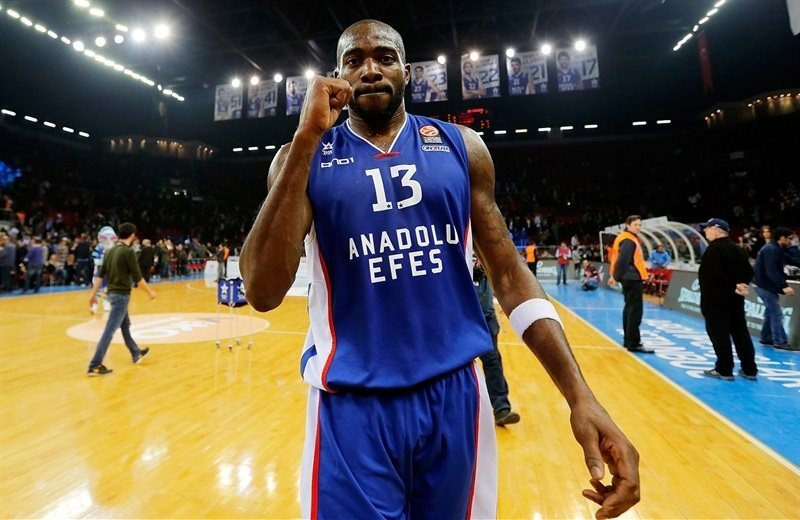 Efes allowed only 12 points in the third quarter, while Dontaye Draper led the way on offense with 14 points, hitting 4-of-4 three-pointers and helping to improve Anadolu’s record to 3-2 in Group F. Nenad Krstic added 13 points, Stephane Lasme chipped in 12 and Milko Bjelica had 10 points in the win. Olympiacos shot just 39% for the game in dropping to 4-1 in the group. Othello Hunter collected 12 points and 8 rebounds to lead Olympiacos in scoring, while Oliver Lafayette and Vangelis Mantzaris both nailed 3 three-pointers in scoring 11 points. 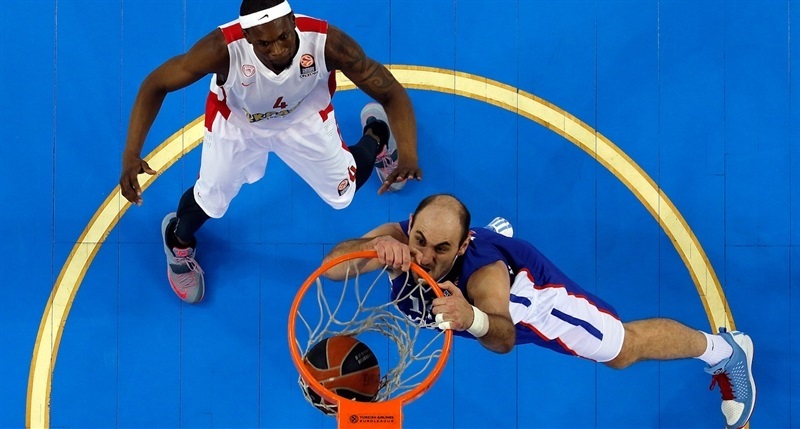 Vassilis Spanoulis was held to just 2 points in the game. 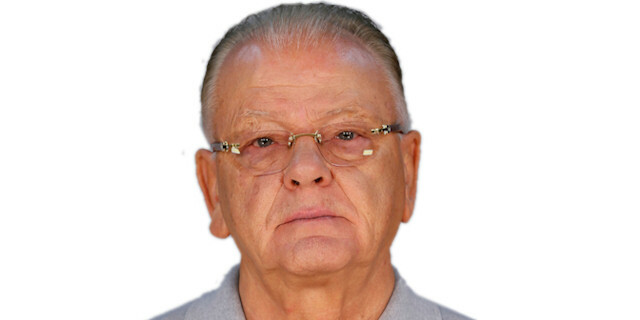 Efes coach Dusan Ivkovic swapped one player in his first five with Lasme in for Krstic alongside Draper, Matt Janning, Stratos Perperoglou and Dario Saric. Giannis Sfairopoulous made one change to his starting lineup as well with Georgios Printezis making his first start of the season in place of Brent Petway alongside Spanoulis, Mantzaris, Tremmell Darden and Bryant Dunston. Draper started the scoring with a driving layup while Darden’s jumper evened the game early on and Bryant putback dunk after a Spanoulis missed layup gave Olympiacos its first lead 2-4. Janning and Perperoglou both nailed three-balls for an 8-4 Anadolu Efes lead. Mantzaris answered with a jumper and three-ball from the right side to put the guests ahead and Darden’s reverse dunk after a steal completed the 0-7 spurt for an 8-11 score line. Perperoglou stopped the run with a spin move before Hunter fought hard on the offensive glass to keep the ball alive for a Mantzaris three-pointer. Hunter followed with an inside basket for a 10-16 advantage. Lasme converted a three-point play to stop the Olympiacos surge and an offensive rebound putback by Saric and two Krstic free throws had Anadolu Efes within 17-18 after 10 minutes. 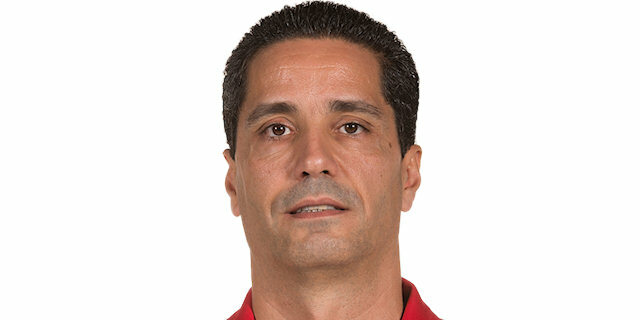 Kostas Sloukas got Olympiacos on the board to start the second quarter with a driving layup for a 17-20 lead. After two Krstic free throws, Bjelica converted a three-point play to push Efes back ahead. Lafayette answered with a three-pointer but Bjelica punched right back with a trey of his own and Krstic threw down a dunk for a 27-24 Anadolu Efes lead – and an Olympiacos time out. Matt Lojeski came out of the talk with a three-pointer for the guests, who then got a long jumper from Sloukas and a dunk by Hunter to go back ahead 29-30. 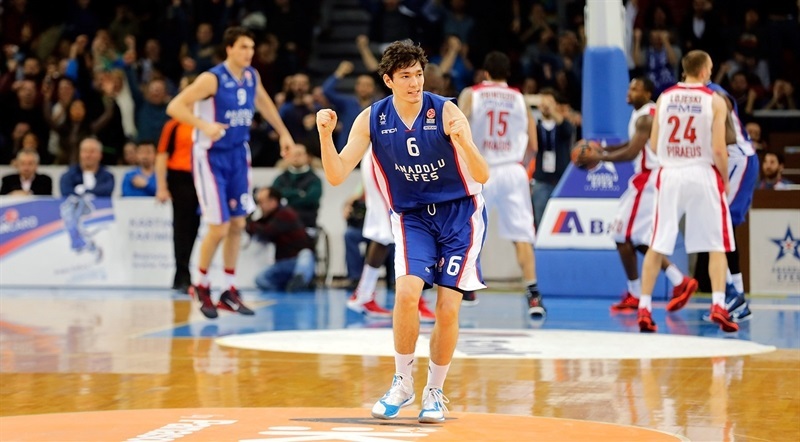 Cedi Osman gave Efes the lead back as the teenager went coast to coast after a rebound for a layup to make it 31-30. Lasme’s score had the hosts up 33-31 before a three-point play by Hunter and a three-ball for Mantzaris to push Olympiacos ahead 33-37. Draper would tie the game at 37-37 but Lafayette nailed a trey at the buzzer for a 37-40 Olympiacos advantage at intermission. Lafayette and Mantazis combined to hit five of five three-pointers in the first half. Thomas Heurtel scored his first points of the game with a jumper and Lasme’s free throw knotted the game at 40-40. 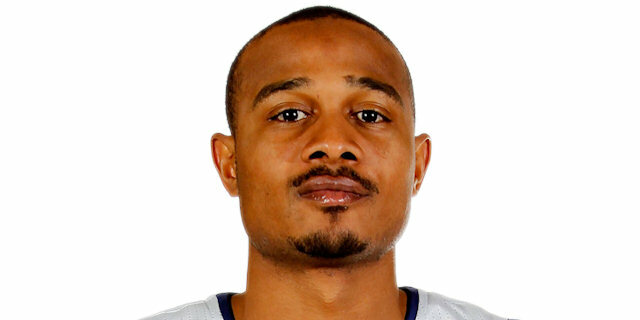 Olympiacos needed until the 7:22-mark in the quarter for its first points with a three-pointer from the left corner by Darden. Lasme knocked down a baseline jumper and Efes finally pulled back ahead 45-43 on Perperoglou’s three-point play. While only allowing Olympiacos to shoot free throws, Heurtel hit a tough layup high off the glass and Krstic drained a long jumper for a 49-46 lead. After Sloukas made free throws, Dogus Balbay gave the hosts a big spark off the bench with a strong driving layup and then a jumper for a 53-48 lead. Bjelica added 2 more foul shots to push the advantage out to 55-48. 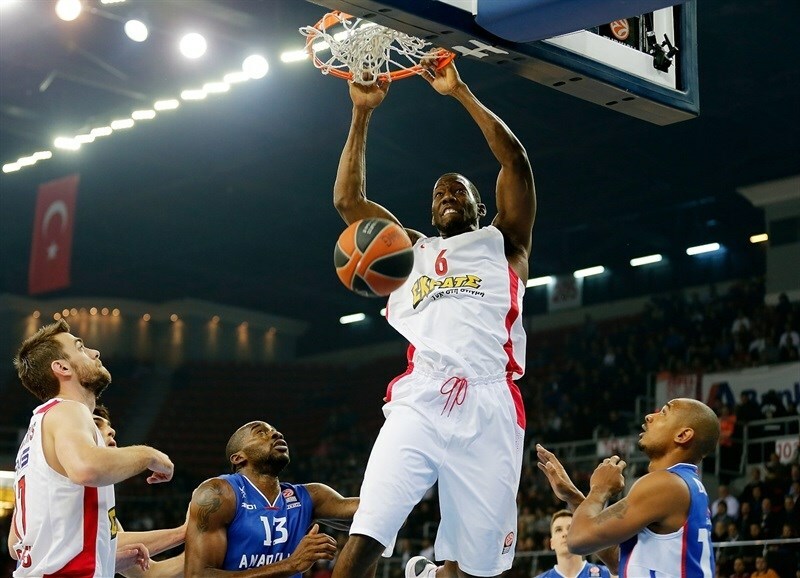 Dunston fought back with two free throws and then a dunk at the buzzer to get Olympiacos to within 57-52. Janning got Efes started in the fourth quarter and Draper added a layup and then a three-ball on the break from the left wing to extend the lead to 64-52. Printezis finally scored for Olympiacos with two free throws at the 7:51 minute mark but Draper punched right back with a three-pointer for a 67-54 advantage at the seven minute mark. Huertel and Janning followed with back-to-back three-balls to push the lead out to 73-55. Lafayette’s three-ball trimmed the gap to 79-64 inside three minutes and Olympiacos would not get closer than 14 points the rest of the way.